PANSPACIFICFLIGHT gelding Wattlebank Flyer posted a best time of 1:55.2 when he won his eighth race on the same track, Albion Park in Brisbane, on 03 October. The six-year-old led from the start in the 1660-metre sprint and gave those back in the field no chance with a 55.5 second closing half mile. He’s proving to be a good bread-and-butter horse for his Queensland owners. Wattlebank Flyer is out of the Courage Under Fire mare Careful Seznicki. Of Panspacificflight’s New Zealand-bred progeny, only Wick (13 wins), Last Flight In (11), Little Rascal (11) and Glenisla (10) have won more races. Wattlebank Flyer won one race for Canterbury trainer Tim Trathen before he was exported. THE LIGHTLY-RACED The Manipulator is back in the Macca Lodge stable of Brent McIntyre after injury appeared to have ended his career in the autumn of 2016. The six-year-old gelding, who looked like he might be the best of Panspacificflight’s stellar first New Zealand crop, was “retired” after breaking a bone in his knee for the second time. 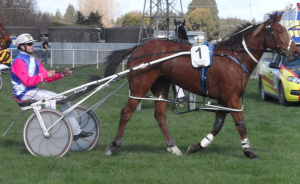 But he recovered fully after a few months on a block of land adjoining the Mataura River and he’s back at the races at Invercargill on 07 October. It’s The Manipulator’s third stint at Macca Lodge. He was born there before being put through the yearling sales ring by breeder Neil Timms, who lives just down the road from Macca Lodge. Neil stayed in the ownership when the Panspacificflight colt caught the eye of Tony Herlihy, but the Auckland trainer had problems with the horse’s gait and it wasn’t long before The Manipulator was on the float back to Southland. The Macca team sorted him out and The Manipulator was an impressive first-up winner — his sire’s first in NZ — in the spring of 2014. The owners then decided to move him to the All Stars Stable in Canterbury, where he won a race before being put aside with his first knee injury. He came back as a four-year-old to win two more races for the Purdon and Rasmussen team before suffering what appeared to be a career-ending second knee injury. At that point he had won four times from just eight starts. Brent says he’s delighted with The Manipulator’s progress and is looking forward to his return to the track. He has had two workouts and won the second of them, coming his last half in 57.1. Paul Ellis has been working him at Oreti Beach. FOOTNOTE: The Manipulator ran a promising third first-up at Invercargill on 07 October.